A special homage to the nationally-renowned Curry Mile is being made at Crazy Pedro’s in aid of Forever Manchester. It stars chicken tikka, onion bhajis, poppadoms and mint yoghurt to create an unforgettable pizza taste sensation. We can’t wait to have a slice! It’s available all way through Forever Manchester Week with 50p going to us, so be sure to get it whilst it lasts. 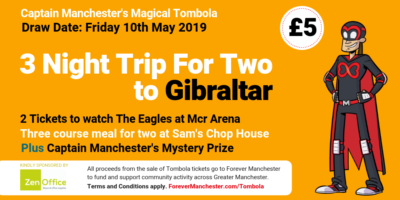 For the full list of Forever Manchester Week events (as well as tasty food and drinks offers), go to forevermanchesterweek.com.